Cookies featuring California native mint. We hope our previous post (April 2016) inspired you to make some alcohol extracts of mints from your garden. These extracts can be used in a wide range of dishes. In fact, they can be substituted in any recipe calling for mint extract. Just remember that ‘kitchen extracts’ – particularly those using native mints – are usually milder than the mint or spearmint extract you buy at the store. You’ll likely need to increase the amount needed; and you’ll just have to experiment to get the right flavor. 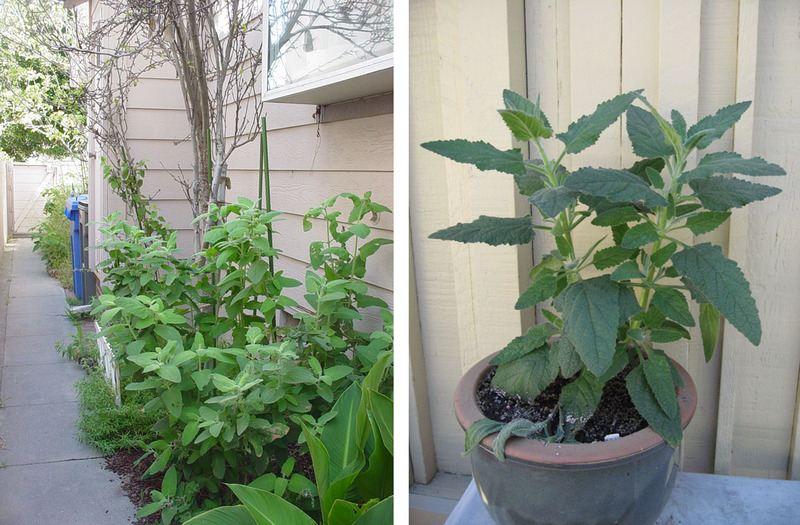 Hint of Hummingbird Sage Cookies: a California mint. 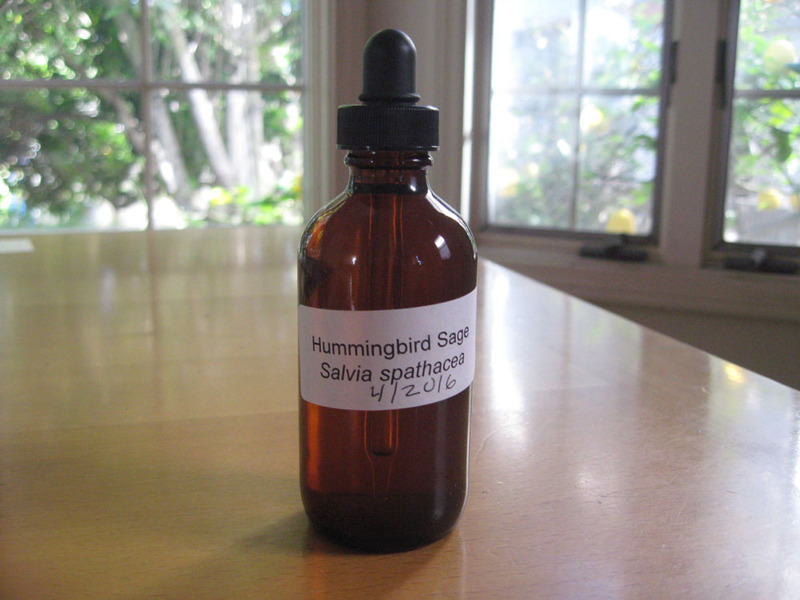 We first made this recipe with Hummingbird sage extract – hence the name. But we’ve found other mints to be equally delicious. We use small (1 inch) cookie cutters for garden events, tea parties and tastings. And we like to use flavored sugars as a topper (see below). You’ll need to flavor and color the sugars ahead of time; but they are an easy way to add a unique, festive touch to these cookies. The recipe is an adaptation of a great sugar cookie recipe from Maida Heator’s Book of Great Cookies. Sift together flour & baking powder; set aside. Cream softened butter or margarine. Add vanilla, Hummingbird Sage extract and sugar. Beat well. Add eggs, one at a time, beating after each egg is added. Add dry ingredients slowly, scraping bowl to be sure that everything is well mixed. Place dough in a wax-paper lined bowl, or divide dough in thirds and wrap each third in waxed paper, plastic wrap or aluminum foil. Chill dough in refrigerator for at least 3 hours. After dough is chilled, preheat oven to 400° F. Take one third piece of dough, and roll it to the desired thickness on a well-floured pastry cloth. We like to slightly flatten the dough with our hands and turn the dough once before rolling. We use a wooden rolling pin with a cloth rolling pin ‘sock’ that has been rolled in flour to keep the dough from sticking. We roll the dough to 1/8 to ¼ inch thick. Cut the dough with cookie cutters. Carefully transfer the cut-outs to ungreased cookie sheets, placing them about 1 ½ inches apart. 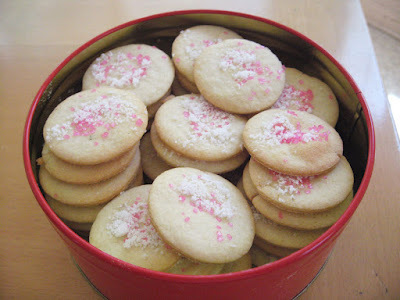 Sprinkle the tops with granulated sugar or colored decorative sugars. 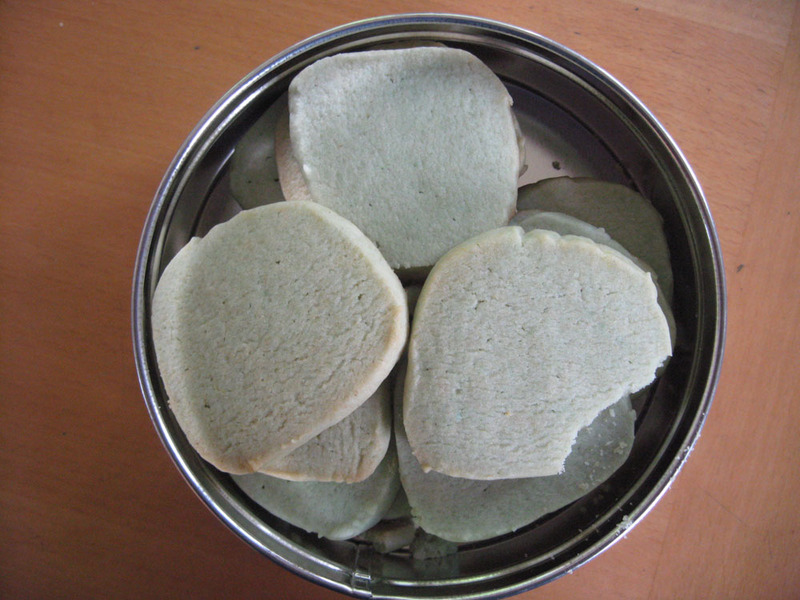 Bake until edges are just lightly tanned – about 8-10 minutes. Keep a close eye on then – they brown quickly. Remove from oven. Transfer cookies to a cooling rack with a large metal spatula (pancake turner). Let cool. Enjoy!! ** We like to make flavored sugars for a finishing touch. Place 1 cup of granulated sugar in a jar or plastic container. Add ¼ cups mint leaves (of the same flavor as the extract), washed, patted dry and coarsely chopped. Cover and let sit 24 hours, shaking occasionally. Remove the leaf pieces using a sieve. Dry the sugar (air dry or in a warm oven) until it no longer clumps. Store in an airtight jar; use within a month for best flavor. The sugar can be colored with a few drops of food coloring. Just add coloring to the jar, then shake until all the sugar is colored. Icebox cookies are usually called ‘refrigerator cookies’ in modern cookbooks. But we like the old time name, harkening back to the days when these cookies were cooled in old-fashioned iceboxes. Icebox cookies are the baker’s dream, particularly when making lots of cookies in a short amount of time. You make the dough, shape it into rolls, then cool the rolls in the refrigerator for several hours. Then you slice the dough into thin rounds and bake. Icebox cookies were the original ‘slice-and-bake’ cookies. We’ve taken a simple vanilla icebox cookie recipe (found in many cookbooks) and modified it to feature our native mint extracts. 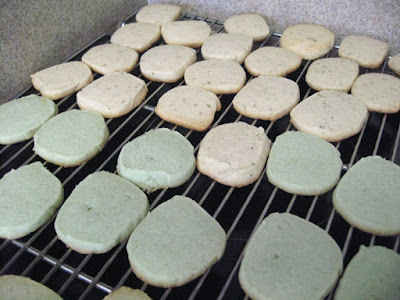 The taste is like a minty shortbread cookie – very nice with tea or coffee, or as dessert. As always, you may need to modify the amount of extract to suit your taste. Place butter/margarine and sugar in a large mixing bowl. Cream until light, then add egg, milk and extracts. Beat until light, fluffy and well-mixed. Sift together flour and soda. Add a little at a time to the butter mixture, mixing until well mixed. Add food coloring (if desired) and mix well. Divide dough into four equal parts. Place each fourth onto a piece of waxed paper. Form the dough into a long roll (like a log), about 1 inch in diameter. 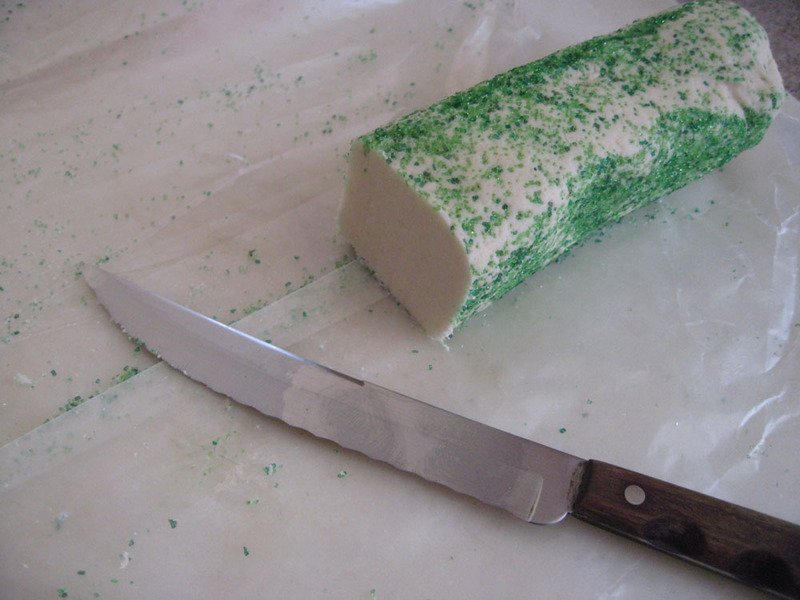 If desired, you can roll the dough ‘log’ over colored sugar to give a decorative edge. Roll up each log in the waxed paper, then place on a cookie sheet in the refrigerator. Chill at least 3-4 hours. Take a roll from the refrigerator, remove the waxed paper, then slice into pieces about 1/8 inch thick, placing each slice 1 inch apart on an ungreased cookie sheet. If desired, sprinkle tops with decorative and/or flavored sugar. Bake at 375° F (190° C) for 5-8 minutes (or when edges are a light golden brown). Remove cookie sheet from oven. Let cool about 1 minute, then remove cookies to a cooling rack. Store in an airtight tin or glass cookie jar for up to 2 weeks. 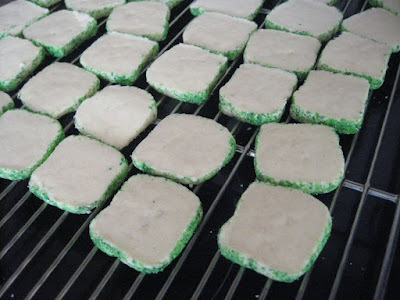 California Meltaway Mint Icebox Cookies. 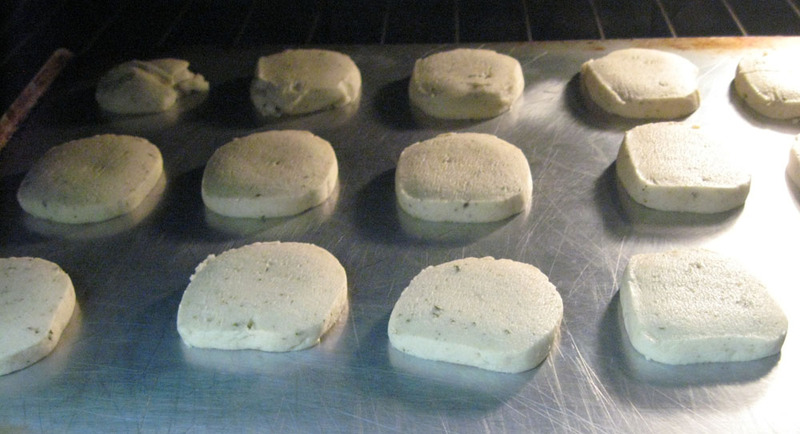 Here is another icebox cookie recipe that works well with our native mint extracts. The texture is somewhere between a cookie and a candy – utterly delish! Place the softened butter/margarine and powdered sugar in mixer bowl. Beat on medium speed 2 minutes, until light and fluffy. Add extracts and mix in. Sift together flour and cornstarch. Add to butter mixture in several batches and mix until just combined. Add food coloring if desired and mix in. Place dough on a sheet of waxed paper (18-20 inches long). Form dough into long roll (log) about 1 to 1 ½ inches in diameter. Spread colored/flavored sugar on waxed paper. Roll log in the sugar to coat the outside edges. Pour off excess sugar (if any). Wrap log in waxed paper. Chill on a cookie sheet in the refrigerator for 1-2 hours. Remove dough from refrigerator. Unwrap and cut into 1/8-1/4 inch slices. Place 1 inch apart on ungreased cookie sheet. Bake at 300° F (150° C) oven for 12-15 minutes. Bake shorter time for softer cookie; longer for crisper cookie. Cookies remain white - don’t really brown. Remove cookie sheet from oven. Transfer cookies to a wire rack to cool. When completely cool, store in an airtight container. We hope you’re inspired to use your new mint extracts in new and creative ways. These recipes are just a starting place – enjoy! The CSU Dominguez Hills native plant nursery is having an end of season sale April 29-30. Most one gallon plants are $5.00, most smaller plants are $2.50 (unheard of prices in 2016). Plan to come and stock up on some great, useful native plants. It’s spring – time for garden tours, tea parties and other garden events. Once again, we’re dreaming up recipes to feature at Mother Nature’s Backyard events. The current abundance of flavorful mint leaves got us thinking about making mint extracts. These extracts can be used to flavor a wide array of California Gourmet treats, from cookies and candies to beverages and baked goods. The Mint family (Lamiaceae) contains a number of aromatic plants whose flavors can be used for cooking. For the most part, leaves are the principal plant part used. 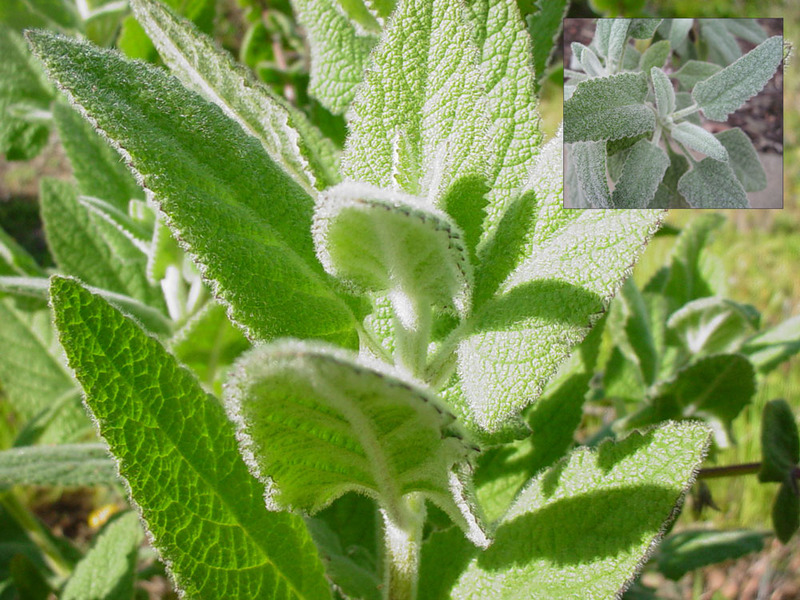 The sages (Salvia species) and Desert lavender (Hyptis emoryi) are best used fresh or dried as flavoring for savory condiments as well as soups, stews, cooked vegetables and breads. 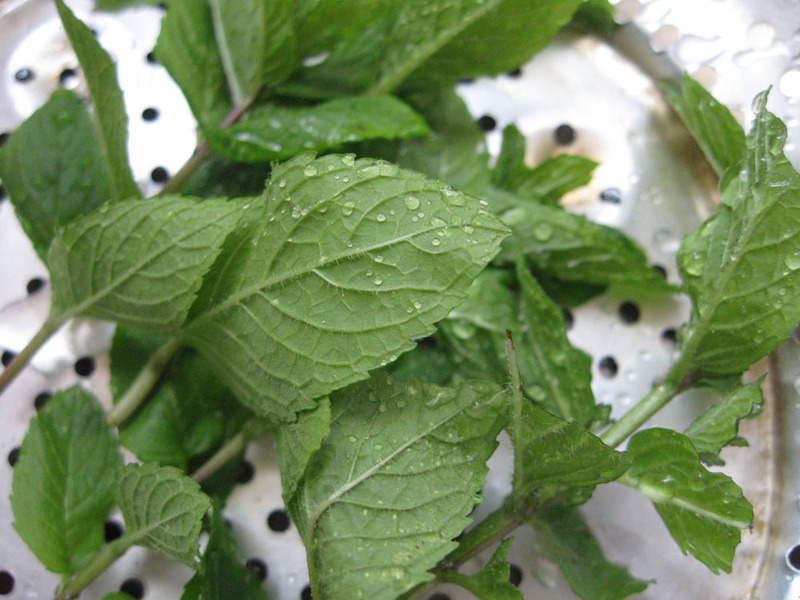 Plants in other Mint genera can be used in both sweet and savory dishes including teas, sauces, syrups, flavored vinegars, vegetable dishes and baked goods. They are welcome additions to traditional recipes that use mint (fresh or dried) or mint extracts. This group includes Hummingbird sage (Salvia spathaceae), the Clinopodium (Satureja) species, the Lepechinias, the Mentha, Monardella and Pycnanthemum species, and Wooly bluecurls (Trichostema lanatum). While fresh leaves are handy in season, many native mints have ‘peak’ and ‘off’ seasons. To use these flavors in the off season, you’ll need to preserve them in some way. In addition, fresh or dried leaves – even well chopped or ground – don’t incorporate well into some recipes, like candies and cookies. So if you want to make a batch of Yerba Buena fudge, you’ll need to extract the flavors into a useable liquid. 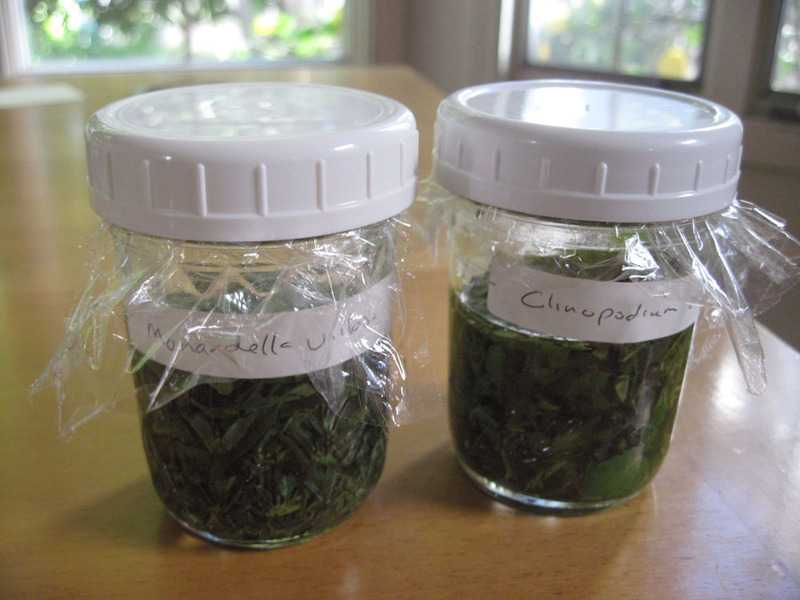 The three main ways to preserve native mint flavors are: 1) to dry the leaves; 2) to make a water-based extract using the leaves; 3) to make an alcohol-based extract. Each method is simple and straight-forward, requiring few ingredients and no exotic equipment. We outline the basics of each method below. One of the advantages of using plants from your garden is you know exactly what species you’re collecting and that the leaves are pesticide-free. First, be sure that the leaves you’re using are edible. 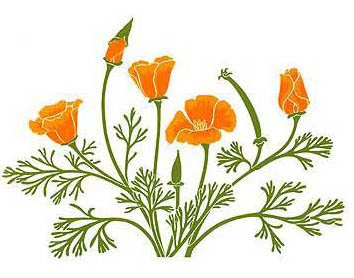 We have a list of California native tea plants that’s a good start: http://www.slideshare.net/cvadheim/south-bay-native-plants-teas-beverages. The FDA Poisonous Plant Database is a searchable internet resource with information on a wide range of toxic plants: http://www.accessdata.fda.gov/scripts/plantox/textResults.cfm. If uncertain, consult this excellent resource before you ingest any new plant part. Collect leaves that are mature, but not diseased or becoming senescent. In Southern California, the best season to collect many types of mint leaves is mid- to late spring. In areas with more spring/summer rain, the optimal time may be late spring to mid-summer. Pick only healthy leaves, collected in the late morning for optimal flavor. Rinse the leaves well in tap water to remove dust, etc. Pat the leaves dry and they are ready for drying. If preparing a water or alcohol extract, shake off excess water, then the chop the leaves into small pieces. Once cut, mound the leaves on the cutting board and hit the mound with a mallet or meat tenderizer (or the flat of a heavy knife) to bruise the leaves. The leaves are then ready to make either a water or alcohol extract. 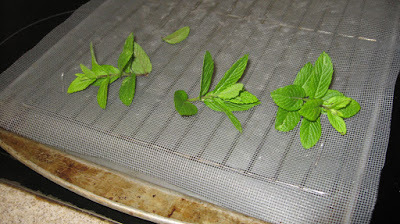 One of the easiest ways to preserve any type of mint leaf is to dry it. The leaves can be dried in a food dehydrator, in a warm oven, or in a warm dry place. If using an oven or air drying, we like to put a piece of clean window screen (purchased at your local hardware store) on top of a cooling rack. The leaves are spread evenly on the screen. The rack is then placed in a jellyroll pan (or cookie sheet with sides) to catch any crumbs. Oven drying requires a low temperature (140° F maximum; 60° C) to retain the flavors. We like to heat the oven to 140, turn off the heat, then let the leaves dry in the cooling oven. You may need to repeat the process several times to get the leaves fully dry. Once the leaves are completely dry and crumbly, pack them into a clean, glass jar with an air-tight lid. Label and date, then store in your spice cupboard. Dried native leaf spices retain their potency for about a year (long enough to get you through to the next season). To use in soups and stews, add whole dried leaves to the pot; remove leaves before serving. To use as a ground spice or for tea, grind leaves in a spice grinder or mortar & pestle. Grinding spices just prior to use gives the best flavor. Another easy way to extract Mint flavors is by making a water extraction – essentially a strong herbal tea – from the leaves. This extract can be used in any recipe that calls for water as a liquid, including cookies, candies, and other baked goods. The advantage of this method is that it’s quick and easy. You can make the extract from either fresh or dried leaves. The flavors are wonderful and fresh, particularly when you use fresh leaves. 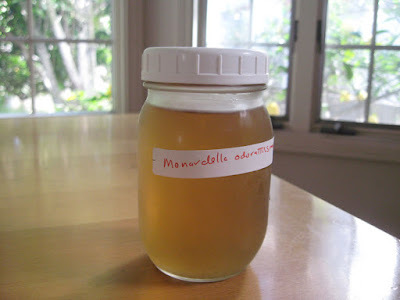 The disadvantage is that the extract must be refrigerated, and it loses its potency within a month or so. The preparation is simple. Take prepared leaves that have been chopped and/or bruised to release their flavor. Place leaves in a non-metal bowl (glass or pyrex) or glass measuring cup. For all but the most delicate of the mints (see below), heat water almost to the boil. Pour hot water over prepared leaves; let sit until cooled to room temperature. For a good flavor, use plenty of leaves – just cover the leaves with water. 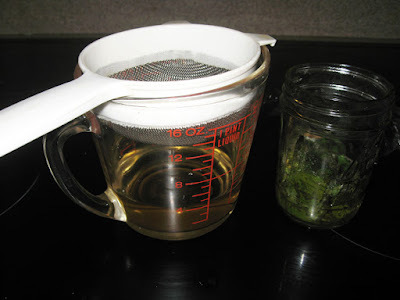 Strain out the leaf material using a fine-mesh sieve or strainer. You can also use a paper coffee filter to strain out the leaf matter. Once strained, the extract is ready to use. Store unused ‘tea’ in an air-tight, well-labelled jar in the refrigerator for a month or so. 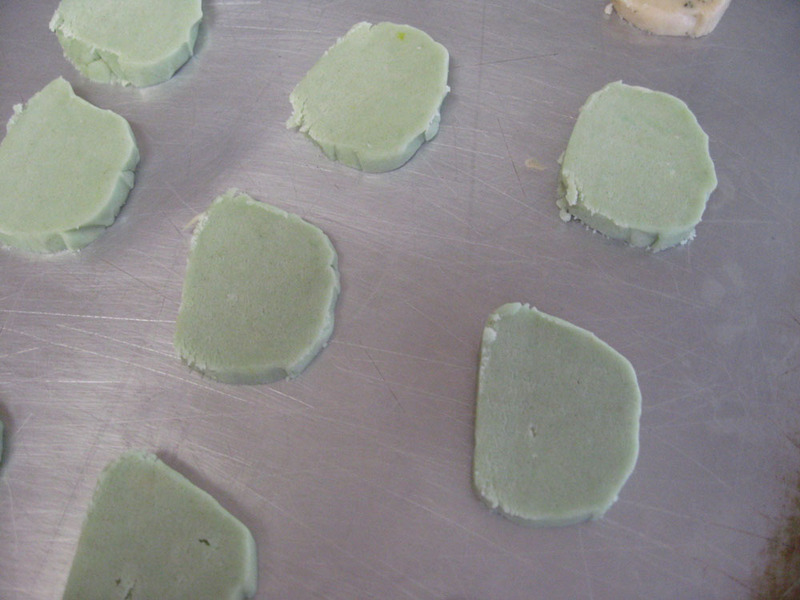 Some Mints have very delicate flavors that do not stand up well to hot water. The Clinopodiums (Saturejas) and a few of the Monardellas come to mind. For these, prepare the leaves as above, then cover with water at room temperature. Let the mixture sit for 1-2 hours to extract the flavor. Strain, then use in your favorite recipe. Making alcohol extracts is simplicity itself. All that’s required are the leaves, some vodka (mid-price-range types will do) and time. And while the extracts are not as concentrated as commercial cooking extracts (commercial ones are distilled to concentrate the flavors) they work wonderfully in the recipes we’ve used them in. Place the cut/bruised leaves into an airtight glass jar. Pour vodka over the leaves to cover. Label the jar with contents and date. Tightly cap and place in a shady place (in a cupboard or pantry is good). Rotate the jar every day for the first week or so. Then let the jar sit for another week or two to allow the extraction to complete. Strain out the leaf material using a fine-mesh sieve, strainer or coffee filter. At this point you can bottle and use the extract, but it will be mild-flavored. To make a more concentrated extract, prepare another batch of leaves, place in a clean jar, pour the extract over the new leaves, and proceed as before. You can repeat the concentrating process several times to get the strength you like. This is an old trick from back when commercial extracts weren’t available; at one time, everyone made their own ‘kitchen extracts’ for common flavoring agents. After the last straining, pour the completed extract into a clean glass bottle (dark-colored ones are good), cap and clearly label with contents and date. Store along with your other flavored extracts. Alcohol-based extracts retain their potency for several years. Use your extract in your favorite recipes. 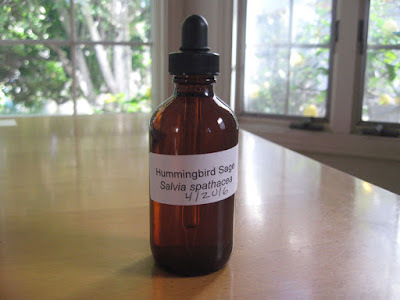 Because home extracts are milder, you may need to increase the amount used (up to twice what the recipe calls for; you’ll just have to taste and adjust as needed). You may also want to use a few drops of vanilla extract, along with your home extract, to make the flavors ‘pop’. We hope we’ve inspired you to try the ‘Mints’ in your garden in your favorite recipes. 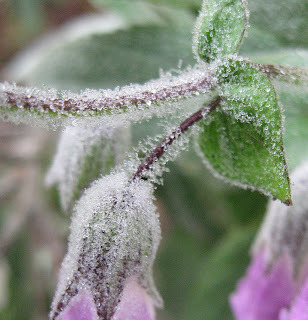 If you have wild mints, Monardellas, Clinopodia, Hummingbird sage or Fragrant pitchersage (April, 2016 Plant of the Month) in your garden, you might want to brew up a batch or two of extract using your favorite flavors. And be sure to look for our recipe for ‘Hint of Hummingbird Sage’ cookies, which uses our home extract, later this month (April, 2016). Several local plants are putting on quite a show this year, despite spotty rains and plenty of wind. 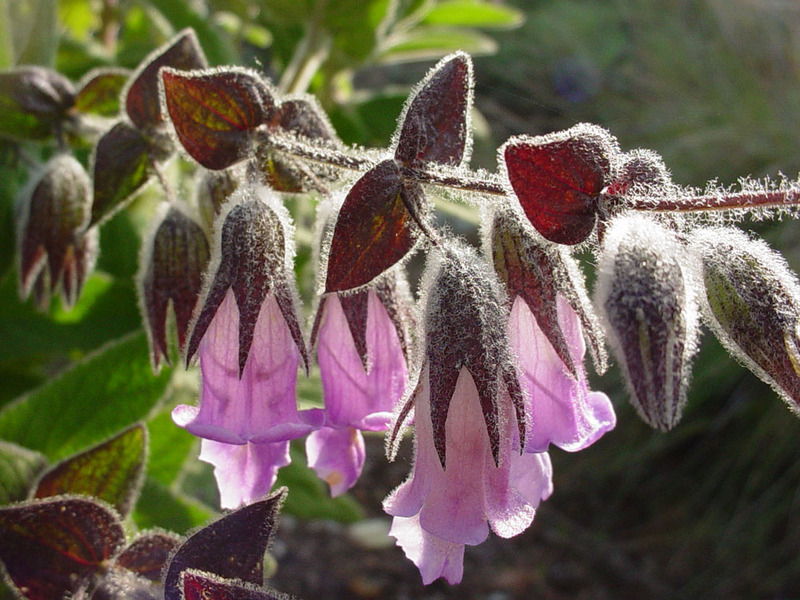 One that’s looking spectacular is our Plant of the Month, Fragrant pitchersage. If you want to see the pretty flowers, now’s the time to visit Mother Nature’s Backyard. If you can’t make it this month, other attributes of this lovely sub-shrub can be enjoyed year-round. 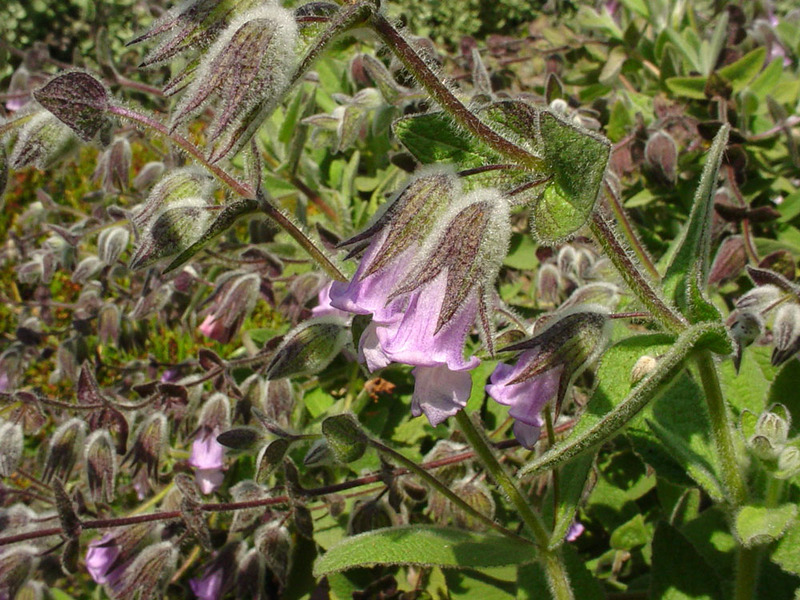 The genus Lepechinia, the Pitchersage genus, is an attractive member of the Mint family (Lamiaceae). Most of the approximately 45 species have the unusual pitcher-shaped flowers that give the genus its common name. Lepechinia are native to South and Central America (to central Argentina) north to the coastal Northern California foothills. 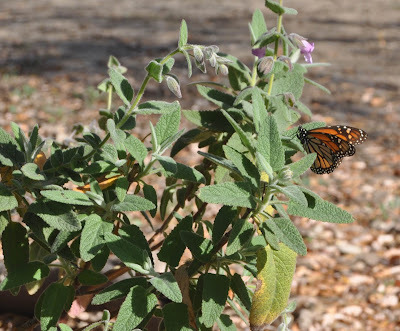 There are five species native to California, with Lepechinia fragrans being the most abundant in Los Angeles County. Like most Lepechnias, it grows in the foothills and lower mountain flanks – in this case of the local Santa Monica and San Gabriel Mountains. It can also be found on both the Northern and Southern Channel Islands. 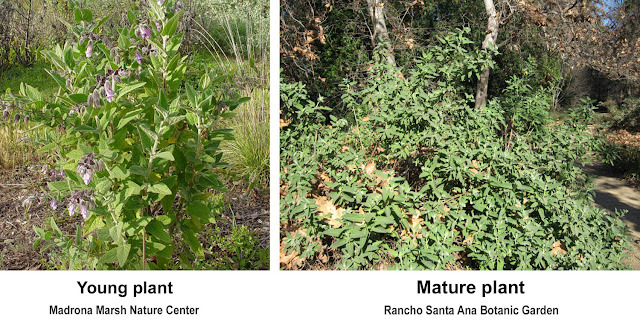 The plants are usually scattered among other chaparral species, most often on north-facing slopes and in canyons that provide a little summer shade. Fragrant pitchersage is a perennial sub-shrub that can grow to 6+ feet wide, but is usually 3-6 ft. (1-2 m.) tall and wide. Plants are vase-shaped in youth, becoming regular, upright and mounded within several years; they become increasingly irregular and sprawling with age (see photo, above). Plants tend to remain more compact in sunnier positions - and if they are pruned. The lower portions of the branches are woody and brittle, while the new foliage is succulent and herbaceous. The plant grows new side branches each year in late winter, sprouting somewhat irregularly from the mature wood. The new branches give the plant a fresh, youthful appearance each spring. The wood itself is rather brittle – it can even be broken in a wind storm. Older branches also seem prone to unexpected winter die-off, at least in our hands. The new spring foliage is pale green and densely covered with velvety hairs. The leaves are simple, lance-shaped, with a stout petiole (leaf stalk) on the lower leaves. The leaves often have shallowly dentate margins (like small pointed teeth). The lower leaves are bigger (to nearly 5 inches; 10-12 cm.) than the upper ones. Leaf color is fresh green to gray-green in early spring, somewhat darker in sunnier conditions (see photo above). Like many local native shrubs, Lepechinia fragrans produces two sets of leaves a year: a larger, more succulent set in winter/spring and a smaller, drier and darker set in late spring. Some/many of the spring leaves are shed during the dry season. Don’t be alarmed when this happens – it’s a perfectly normal adaptation to our dry climate (for more see: http://mother-natures-backyard.blogspot.com/2015/10/how-things-work-plant-drought-tolerance.html). As seen in the photo above, the new foliage (and even the flowers) is sticky with glandular hairs (trichomes). These produce the chemicals that combine to produce a distinctive fragrance. This species is aptly described as ‘fragrant’; brush by it or rub a leaf in your hands to release a fresh, minty, but entirely unique scent. We grow this plant in part for its aroma, which we add to potpourri, tea and other dishes. As far as we know, the chemical composition of Fragrant pitchersage has yet to be studied. 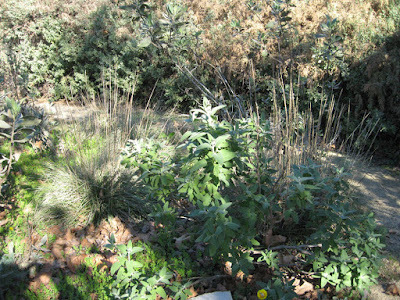 But other Lepechinias make a complex mix of aromatic chemicals – many with medicinal properties. The closely related Lepechinia calycina produces anti-oxidant and anti-bacterial compounds and is used medicinally to treat colds and uterine infections, and as a poultice for skin problems. It was also combined with olive oil and Creosote bush (Larrea tridentata) to make an early sunscreen. Mexican and Peruvian Lepechinia are well-known medicinal plants, whose chemicals are currently being evaluated for medical potential. We suspect that Lepechinia fragrans also has medicinal properties. Fragrant pitchersage has exquisite flowers. A pale lavender color, they hang down from long, slender flowering stalks. There are often 10-15 flowers per ‘wand’ in our gardens. The calyx (formed of fused sepals) also has a purplish tinge. In the ‘El Tigre’ cultivar (see above), the calices are a dark red-purple and very showy indeed. The flower color is also a little darker in this cultivar (at least when we’ve seen it). The close-up picture, above, shows the unique shape of the flowers. The petals are fused into a funnel-shaped throat with three upper lobes and two fused lower lobes that form the ‘lip’ or ‘pouring spout’ of the pitcher. The coloration is subtle, often with streaks of white or paler violet and darker veins. The sexual parts - two pairs of stamens and a double-lobed style – are mostly hidden within the flower’s throat. You can see them shadowed in the previous photo. As the flower matures, the calyx enlarges and becomes more purple-tinged. It ultimately forms a dry, persistent seed capsule that contains four smooth, round, dark seeds. You can see flowers at all stages of development in the photograph above. The main pollinators of Fragrant pitchersage are the large bees, primarily bumblebees. But hummingbirds and large butterflies, like the Monarch seen above, also visit the flowers with some regularity. We suspect they also contribute some effort to the pollination process. The flowers in our gardens produce abundant seeds; the pollinators are efficient, whomever they may be. Fragrant pitchersage is not particular about soil texture. We’ve grown it in both sandy and clay soils; it may do a little better in clays, but is possible in either extreme. Providing the correct light conditions is a bit trickier. Plants become leggy and are short-lived in too much shade; but they also balk at hot, sunny conditions. The ideal is bright shade (on the north side of a wall or tall hedge) or a place with good morning sun and a little afternoon shade. As with many chaparral shrubs, Lepechinia fragrans is quite drought tolerant once established, but tolerates occasional summer water. If you live in the lowlands of Western Los Angeles or Orange Counties, watch the weather reports for the surrounding foothills. If the foothills are getting rain, you might want to give your Lepechinia a little artificial ‘rain’. 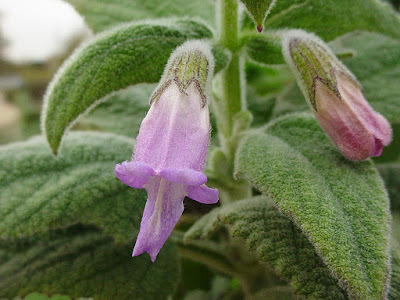 On the whole, Lepechinia fragrans is easy to grow. Fresh seeds germinate with no special treatment, and seedlings mature quickly into elegant plants. Tip-prune shoots during the growing season to produce a plant that’s bushy and full. That’s really about all that’s required; this plant is not usually bothered by pests. Unlike other Lepechinias, this species does NOT respond well being severely cut back in the fall. While Fragrant pitchersage has a reputation for being short-lived, it’s well worth a spot in your garden. Plant it as a specimen plant in a place of honor. Since it takes some shade, it can be used in narrow side-yards and on the north side of walls. We like it as a background plant in mixed beds with Douglas iris, Heucheras, hummingbird sage and other native mints and woodmints. And while we’ve never grown it in a container, we’ve seen a nice example at Rancho Santa Ana Botanic garden. Be sure to locate it where you can enjoy the flowers – and the hummingbirds, bees and butterflies – close at hand. Place it where you can easily rub the leaves for a quick ‘pick-me-up’ as you walk by. Harvest leaves for use in fresh spring tea; you’ll probably also want to dry some for later use. Fragrant pitchersage makes a lovely iced tea in summer and can be made as a sun tea (see http://mother-natures-backyard.blogspot.com/2012/06/making-tea-from-california-native-mint.html). In summary, Lepechinia fragrans is a joy to behold – in bloom or not – and a must for aroma gardens. It’s part of our vanishing natural heritage here in Los Angeles County; it ties us to the land and the wild bounty of our local foothills. We hope you’ll consider it for a brightly shady area of your own garden.